I don't know if it's because it's been so hot in NYC this summer but I find that I'm more attracted to cool hues of late. And my favorite shade is currently mint. It all started with the mint dot J. Crew jeans I picked up on sale and can't get enough of. Since then I've been browsing for more minty items to add to my closet. Is this a color you like? What do you pair it with? I love this color. It's a perfect color for this season. Beautiful selection of pieces. Lovely dress and sunglasses. I already feel cooler just by looking at this color. It sure is a very pretty and relaxing to eyes, i need to get something in mint. Stay cool over there Rowena. Love this colour, its sublime and so sweet! The maxi dress is so pretty and adore your selection of delightful accessories. Mint is always a great choice! ooh you are enabling me with those jeans! I just wish I could remember my size in J. Crew jeans! Mmmm yes! I love everything you've chosen! All of the accessories are perfect, and I want that dress! I must say, you've got great taste lovely lady :). Rowena, I love it too! I purchased a dress (that I haven't worn) and sandals (that I haven't worn yet either hahaha) I need to wear both soon. I love that dress and those jeans! How gorgeous! The color mint is soooooo cool! Those pants are adorable and I love the necklace as well. I like the color mint but it doesn't look nice on me so I don't buy it for clothing. I found Mr & Mrs Cute Bunny and their adorable baby staring longingly at my plants this weekend and thought of you because I know how much you love bunnies. I had to make them move though, I didn't want them getting any ideas about eating things again this year. Love your polish & necklace picks. Nice selection!!! I love this color!!! I agree - mint is one of those classic cool summer colours and those pants are so cute. I like the nail polish too. All pretty and feminine! Oh loving that mint and black maxi! I saw a chevon patterned maxi in a window today I am thinking of getting. R u going to The Lucky event tomorrow? Great items and LOVE the butter London nail polish !! I always love a bit of mint for summer with a touch of gold! Lovely maxi and picks! Hope all is well with you darling. i love it! i would pair it with a red or a orangy red! i love those jeans and sunnies! Mint has always been on of my favorite colors. I love the items you have chosen. My favorite is the polka dot pants. i love this color... so refreshing! Mint is allll over the place nowadays and I absolutely adore it. I pretty much like anything that can call itself pastel! I've been a fan of this colour from a few years now, it's the only sort of pastel tone i can tolerate. 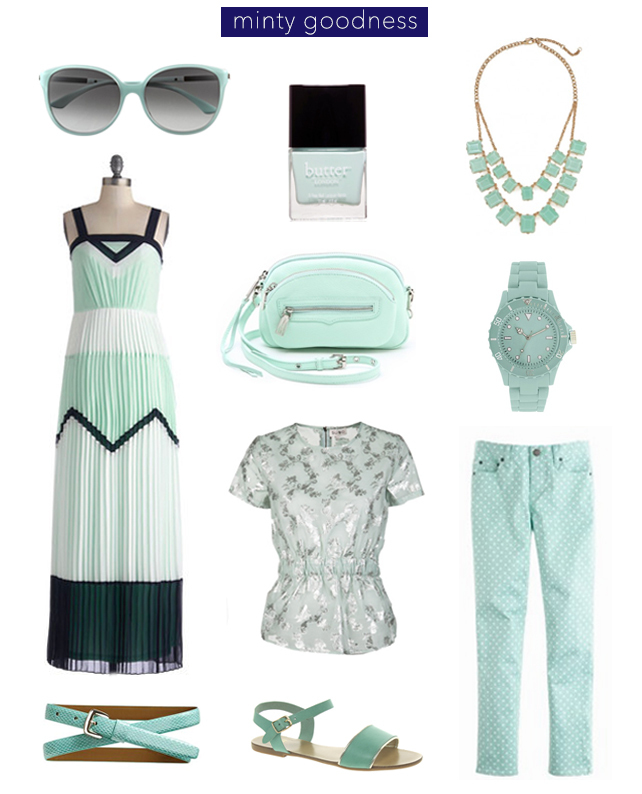 I love love mint color during summer, it's just so fun and an attracting color! 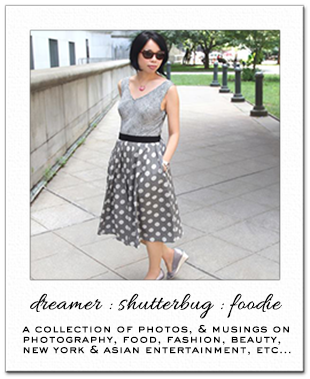 How about following each other on Bloglovin and GFC? Let me know ^_^ hope to stay in touch! Love all of these mint colored finds! I need the belt! Mint is such a pretty colour. Loving all your selections!